The last chair mat you'll ever have to buy! Works Great on: Thick Carpeting, Hard floors (tile & wood), Twice the thickness of most other brands, holds up to constant everyday use outlasting vinyl, polycarbonate, acrylic and PVC floor mats ten to one. Our mat does not roll up; it ships flat and is a solid non-bendable design that simulates a hard floor surface. Hard plastic chair mats prevent "sinking" because they don't indent and will not crack or split. 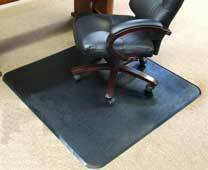 Premium chairmat made of 1/4" thick heavy-duty high impact resistant thermoplastic. Works on hard floors (tile &amp; wood), as well as all thickness of carpeted floors. Textured top surface &amp; ramped edge for easy chair movement. Anti-skid backing keeps it from slipping. It also accommodates chairs with non-castered legs too. Prevents floor damage such as indents, scuffs, marring and scratches. It washes up easily with soap &amp; water and requires little maintenance.The last mat you'll ever have to buy! Backed by our lifetime warranty against cracking, splitting, indenting etc with normal use (see warranty below). The best value chair mat in the industry. Lifetime warranty, best price, best quality. Proudly made in the USA. LIFETIME WARRANTY: Guaranteed to be free from defects in workmanship or material and free from cracking, indenting, splitting for as long as you own the mat. NOTE: warranty voided when used with metal casters of any type. Should the chairmat break or crack under normal usage and proper application, we will replace the chairmat upon proof of purchase. Click here to read the full warranty. Quantity discount pricing available. Feel free to call or email for higher quantity pricing or any questions. Call toll-free 800-286-5471 or order online. Custom sizes are available - just email us for a free quote. We also accept PO's from Government Agencies, Schools & Universities.